A non-operational oil rig exploded off the coast of Louisiana resulted in at least one death, with one crew member still missing. An ongoing investigation is being conducted by various government agencies to determine the cause of Friday’s oil rig explosion of the coast of Louisiana. One worker is dead, another is missing and 4 others are being treated for second and third degree burns as a result of the incident. A seven member investigation unit, consisting of engineers, safety inspectors and law enforcement from Department of the Interior Bureau of Safety and Environmental Enforcement began investigating the explosion shortly after the explosion at the rig stationed about 17 miles southeast of Grand Isle, La. The U.S. Chemical Safety Board served Black Elk Energy, the Houston-based operator of the rig with a subpoena as it gathers information. The explosion resulted in an oil spill, reported by the U.S. Coast Guard to be about 200 yards by one mile large. 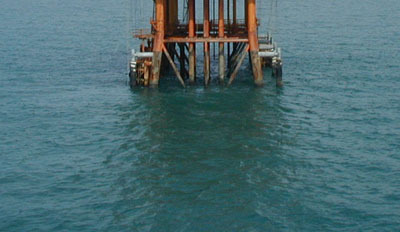 The West Delta 32 platform had not been operational since August, but there were a total of 26 workers on the rig at the time of the explosion. The Coast Guard responded with three planes, five helicopters, and five boats in order to evacuate the crew. The coast Guard conducted a search and rescue mission over a 1,400-square mile area. The body of one crew member, Elroy Corporal, 42, was recovered on Saturday, while another crew member remains missing. At the time of the explosion, workers were cutting a 75 foot pipe, but instead of using a “cold cutting” tool which produces no spark, the crew used a cutting torch, which is believed to have ignited the estimated 75 gallons of oil within the pipe. The explosion comes the same week at BP announced it’s $405 billion settlement with various government agencies following the 2010 explosion of the Deepwater Horizon oil rig in which 11 crew members were killed and resulted in the nation’s worst man-made ecological disaster. Enough Is Enough...Another Change to Fluke Regs Comes Down! Obsessed Fan Shoots Girlfriend Over "The Walking Dead"
Subject: LongIsland.com - Your Name sent you Article details of "Oil Rig Explosion in Gulf, One Dead, Another Missing"